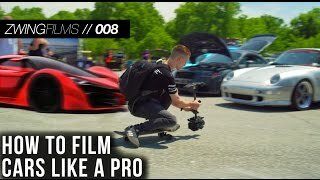 Vlog 008 On top of a documentary style recap of the first ever European Experience car meet presented by SOWO, this video offers EXCLUSIVE TIPS from some of the hottest film makers in the automotive industry. Pro Tips include tips on gimball or hand held shooting by Mike Koziel, a glidecam tutorial by from Zwingfilms, raising the value of your production with audio from Halcyon, learning about locations with Krispy and how to engage your audience by Sebastian Rodriguez! Don’t forget to subscribe if you haven’t already and make sure to leave a comment with any questions or feedback you may have and as always please rememeber to give this video a thumbs up if you enjoyed it or learned something from it. Thank you! ive watched this video so many times. im about to staRT my own car channel too. looking into cameras and am stuck between the panasonic g7 and the sony a6300. the g7 is half the cost with comaparable quality. ether way im so excited. what was the mic used on that audi r8? What’s a good beginner computer to get HP or apple ? What’s the name of the song playing in the car at @6:03 the guy’s car that shouts "black"
Whar editing software do you man, pls respond!! Yooo you guys are killing the scene bro! Harnesses dope ads cameras cars etc salute man!! What’s the stabilizer is that you guys are using not the glidecam. Awesome video… There’s very few places (people) can go to learn things , when it comes to the specific type of media (shooting cars )… It’s awesome to have a resource like this. You should definitely do more videos pertaining to just shooting cars . this video is a hidden gem!! This was an awesome vlog! Why this video is no longer aviable? you guys talk about everything but not camera profile ? Is there a video on that mounting hardware to hold him out the back of the SUV? This was sooo good to watch. Watched this like 3 times now. Jealous of the group you’s have got going. Sick. Great Video! What lenses do you use for the Panasonic? Lovely video ! Really helped ! Great Vid man! Keep up the great work! What program are you using to edit? what lens is it at 15:57? Hey guys, great video! I definitely subscribed so I can use tips and tricks to make my channel better. Y’alls personalities and knowledge, along with the cinematography, made this video outstanding! Great job! The way the exhaust synced with the music at 18:09 got me lit! It’s awesome to see all these amazing artists come together to show the behind the scenes of how things are done. These guys are inspirational to me and recently I have became really interested in car videography and that’s how i found this video. I now wanna get out there and start filming. Thanks for this awesome film! what is the title of the background music? does anyone know what it is? thanks.